The Realistic PRO-30 is a vintage 16 channel scanner. Due to its spacious layout, it's fairly easy to equip it with a discriminator output. The scanner uses an MC3357 FM detector IC. The baseband audio signal can be found on pin 9. 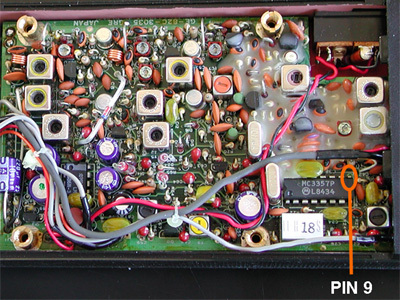 A 10 k resistor is soldered to pin 9 of the MC3357. 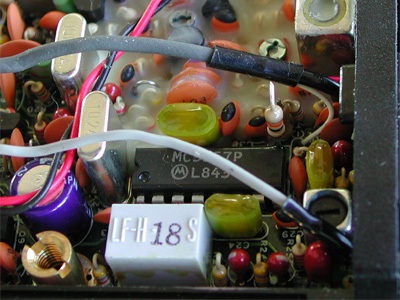 The resistor's other lead is connected to a 3.5 mm chassis socket, which can be mounted in the back of the scanner. The chassis socket's ground lug can be connected with the metal shield of one of the coils close to the discriminator IC.